Walking along the Benjamin Franklin Parkway, Thursday, Feb. 9, 2017. Bring out the light jackets today, but it's back to scarves and gloves by the weekend. The strange weather predicted this week follows the rollercoaster-like pattern we saw in February, when temperatures crept up to the 70s only to dip back down to the 20s over the weekend. It'll feel a lot like spring Wednesday, but don't get too used to the warmup according to forecasters – there's a chance of snow in the coming days. 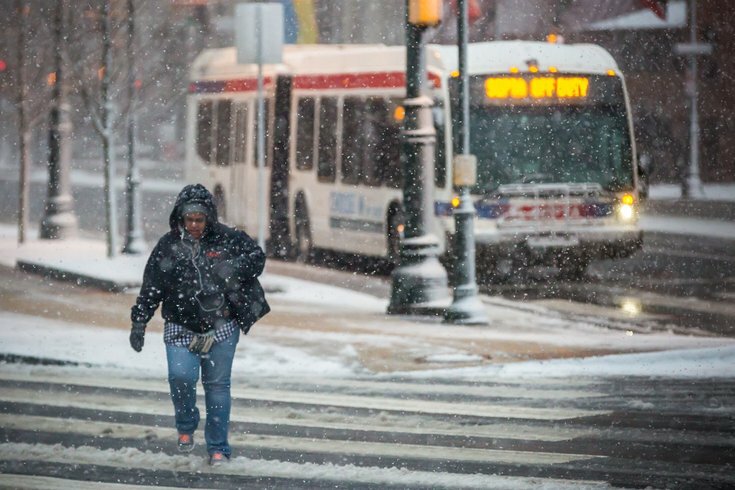 Wednesday will make for blue skies and higher temperatures with a high near 62 degrees in the Philadelphia area, according to the National Weather Service. The afternoon will be a bit blustery, however. Winds are expected to reach 10 to 15 mph in the morning but will pick up in the afternoon to around 16 to 21 mph. Gusts could reach up to 43 mph at night, when temperatures will drop to about 43 degrees. Thursday will again be mostly sunny with a high near 58 and winds reaching up to 17 mph for the region, making way for an ugly night with a 50 percent chance of rain expected after 9 p.m. Up to a quarter inch could accumulate, according to forecasters. The low will dip back down to 34 degrees, making way for expected rain and snow on Friday before 10 a.m., which could make for a nasty mix – a 70 percent chance of rain is expected to fall between 10 a.m. and 5 p.m., switching back to rain and snow after 5 p.m. AccuWeather warns of a slippery morning commute. An inch of snow accumulation is possible, and the high should only climb up to 40 degrees, according to the NWS. The wintery mix should end after 7 p.m. The low is expected to drop all the way to 22 degrees. The rest of the week won't get much nicer – Saturday's high is just 33 degrees with a low of 22, while Sunday should be sunny with a high near 35 before dropping back down again to 22 degrees. Monday should warm up slightly, with a high near 42 degrees and a low around 32 degrees. Rain and snow are both possible for Monday and Tuesday, when the high will be near 46 degrees.